Abstract: This article discusses the seemingly simple case of billiard physics. We will visualize collisions and roll using Delphi XE2 and FireMonkey. 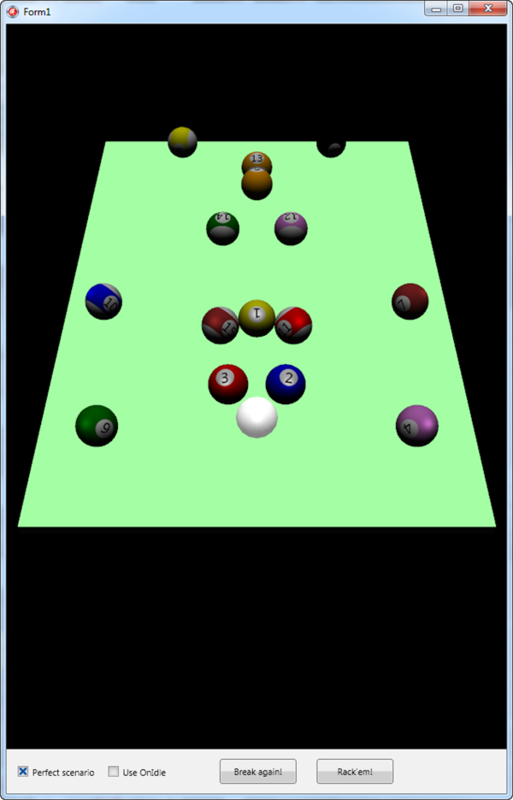 We will be focusing on collisions between billiard balls. 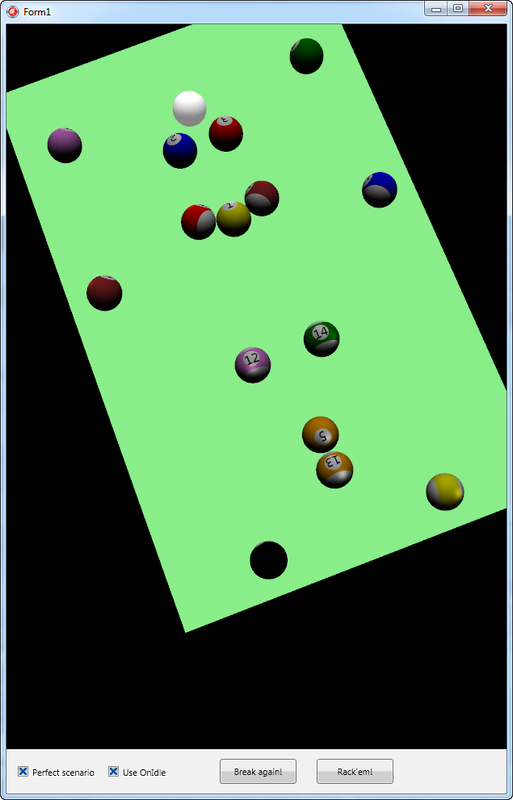 We'll also simulate friction between rolling balls and table, as well as simulating roll. We will completely ignore things like English (side spin), slipping (zero friction), spin transfer, as well as just about everything else. Oh, no jump shots either (gravity). You can find an excellent discussion on Billiard Physics here. OK, so that takes care of the collisions between balls. Collision with the rail can be (over)simplified as simply reversing the component of the velocity vector that is perpendicular to the rail in question. This allows me to rotate around each axis independently and avoids complicated vector rotations (please tell me how to do it if you know how). The screen shots below show the demo application. Before hitting the cue ball, final stage of simulation of a perfect scenario, as well as the final stage rotated around. You can find my demo application in CodeCentral. You can play around with a lot of things in this demo. 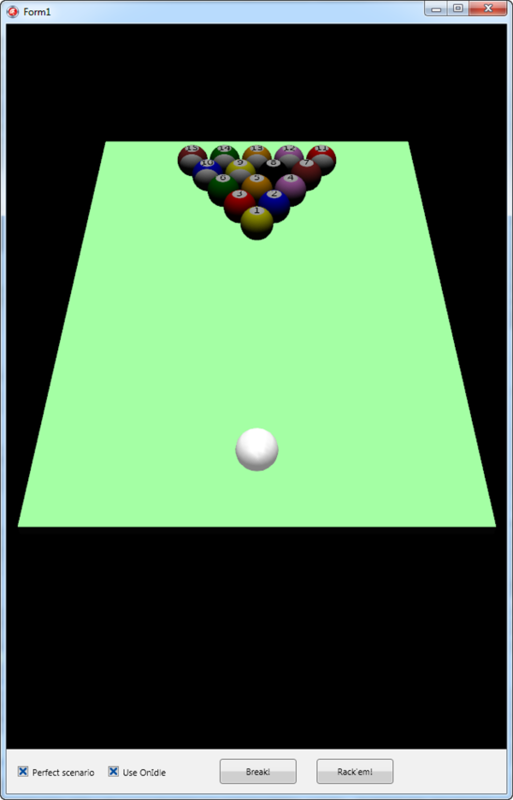 Feel free to elevate the cue ball above the table and watch the collision happen in 3 dimensions (velocity in Z-axis as well). Very poor coherence in this article. sidespin and cushion play is needed to really make it enjoyable. But nowhere have I found anyone willing to show how this can be done. Please consider a future version where this is included.